With deer becoming increasingly active, and daylight saving time soon to put more vehicles on the road during the hours when deer move most, the Game Commission is advising motorists to slow down and stay alert. Deer become more active in autumn with the lead-up to their fall breeding season, commonly referred to as the “rut.” Around this time, many yearling bucks disperse from the areas in which they were born and travel, sometimes several dozen miles, to find new ranges. Meanwhile, adult bucks more often are cruising their home ranges in search of does, and they sometimes chase the does they encounter. Each year, insurance provider State Farm compiles a report on the likelihood drivers in each state will collide with a deer or other large animal, and Pennsylvania regularly is near the top of list. This year is no exception. In the 2017 report, released earlier this month, Pennsylvania remained third among states. 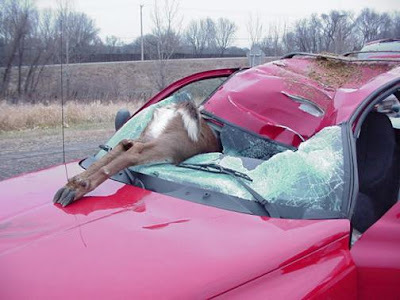 According to the report, Pennsylvania drivers have a 1-in-63 chance of experiencing a collision with a deer or other large animal – a 6.3 percent increase from 2016. A driver who hits a deer with vehicle is not required to report the accident to the Game Commission. If the deer dies, only Pennsylvania residents may claim the carcass. To do so, they must call the Game Commission region office representing the county where the accident occurred and an agency dispatcher will collect the information needed to provide a free permit number, which the caller should write down. Those taking possession road-killed deer also are advised of rules related to chronic wasting disease (CWD) that prohibit the removal of high-risk deer parts – essentially the head and backbone – from any established Disease Management Area (DMA). Those parts must be removed before the deer is transported outside a DMA. For DMA maps, the complete list of high-risk parts and other information on CWD, visit the Game Commission’s website. If a deer is struck by a vehicle, but not killed, drivers are urged to maintain their distance because some deer might recover and move on. However, if a deer does not move on, or poses a public safety risk, drivers are encouraged to report the incident to a Game Commission regional office or other local law-enforcement agency. If the deer must be put down, the Game Commission will direct the proper person to do so. To report a dead deer for removal from state roads, motorists can call the Department of Transportation at 1-800-FIX-ROAD.